A 35 year old woman presented to Medical Walk-In Clinic with the chief complaint of the sudden onset of severe intermitent right flank pain for 6 hours. She noted moderate nausea with one episode of vomiting, but denied fever, abdominal pain, or diarrhea. She did note a slightly dark discoloration of her urine without dysuria. Past evaluations for similar symptoms, including plain films, intravenous pyelograms, and ultrasounds had been unrevealing. In all previous episodes, her symptoms had resolved within three days of onset with supportive therapy. The patient describes the pain as being "right here [motioning towards her right flank], under my thumb," and states that she "just wants some satisfaction here - it's time somebody figured this thing out." She now presents for further evaluation and management. On exam, the patient appeared well-developed and well-nourished, but in some distress due to pain. Head & neck, throat, lungs, heart, abdomen, and neuro exam were all within normal limits. Laboratory studies were normal except for a urine dipstick showing the presence of brown sugar. KUB films, IVP, and renal ultrasound were within normal limits. As seen in the H&E stain of the renal tissue shown above, the presence of multiple Stones in the kidney interstitium is readily apparent. 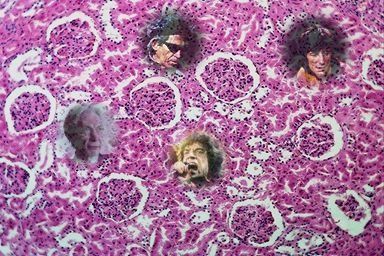 This condition, known as nephrolithiasis, or "Kidney Stones," is a not-uncommon disease affecting hundreds of thousands of persons in the United States and abroad, although its incidence appears to be declining as muscial tastes expand into rap, hip-hop, R&B, and grunge/alternative. Signs and symptoms vary, but the inability to achieve the satisfaction of a definitive diagnosis despite trying, trying, trying, and trying is typical. The visualization of one or more Stones on a renal biopsy is pathognomic. Note that the presence of Charlie Watts in the mesangium, most often seen in teenage women, is a particularly onimous finding. The proper treatment of Kidney Stones includes smoking cessation, Geritol, and ample amounts of Metamucil as needed, with unfortunately high relapse rates among all age groups.